Spot on: Captain Adam Hayton. 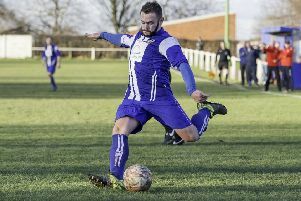 Glasshoughton Welfare were unable to climb into the top 10 of the Toolstation NCE Division One when held to a draw in a home game against Selby Town on Tuesday night. Welfare were up against opponents two places and two points above them in the table and struggled to break them down in a dismal game that ended 0-0. Chances were few and far between, although Selby keeper Pete Lawrie pulled off good saves to deny Rich Collier and Nathan Keightley. At the other end, stand-in Welfare keeper Andy Holland was rarely troubled with a Wayne Brook shot going well over. Jack Stocks and James Arnold also put efforts over. The result left Welfare in 11th, but they are only six points off second. Despite turning in probably their worst display of the season, Glasshoughton beat Nostell MW 3-0 last Saturday. The side showed one change from the side beaten in midweek in the FA Vase at Hemsworth with Louis Akeister replacing Olly Maude. Newly appointed Nostell manager Chris Ellerby signed five new players on the day prior to the game and remarkably, the visitors side showed nine changes to the side who had drawn 2-2 with Glasshoughton in the league game between the clubs just five weeks earlier. Former Glasshoughton players Blaine Kellett and Jamie Simpson were in the visitors’ starting 11. In the opening stages the home side appeared disjointed and Nostell were on top with Simpson having a cross cleared then two corners for the visitors being cleared. Anthony Brown shot across goal with no- one on hand to put the loose ball away and later the same player shot high over the bar. At the other end Rich Collier headed a corner wide and then Nathan Keightley totally missed his kick when an opportunity arose before having a second chance, as he lost possession when through on goal and visiting goalkeeper Richard Watson gathered. Just before half-time home keeper Danny Waring made comfortable saves from shots by Simpson and Brown. Glasshoughton opened much stronger in the second half, forcing an early corner although at the other end Simpson fired across goal with a number of visiting players unable to latch onto the ball. Glasshoughton took the lead on 65 minutes when great persistence on the right by Callum Harrison saw him cross the ball and Keightley hammered home. Four minutes later it was 2-0 when a Keightley free-kick from the left was headed home by Andy McManus. The hot spell continued as in the 70th minute Ryan Poskitt hit a cross from which Ashley was Scothern brought down as he attempted to bring the ball down. Captain Adam Hayton stepped up to slot the resulting penalty past Watson. The home side were now on top and Watson made a great low save to his right before man of the match Collier was unlucky to hit the post with a drive. Just before the end, a thunderous shot from Jermaine Moyce struck Watson and rebounded for a corner. This Saturday Glasshoughton are back on their travels when they face Winterton Rangers, who are up among the early season frontrunners in Division One and six places higher. Kick-off is 3pm.